Unlike many seeds, hemp protein made from raw hemp seeds contain all 20 essential amino acids, both essential and non-essential. For this reason, hemp is one of the best plant-based protein sources of all kinds. Complete amino acids are necessary for forming protein in the body, which fuels and repairs muscle cells, regulates neurotransmitter function in the brain, and regulates the nervous system function. Hemp seeds have a fair amount of fat, but hemp protein is actually a very lean source of protein. Hemp protein is made by cold-milling hemp seeds. During the process, some of the fat is removed and the final product is mostly the natural protein found in hemp seeds. Lean sources of protein are beneficial for digestion, metabolism, and for promoting a healthy, lean body mass. Three tablespoons of hemp protein powder contains roughly 90 calories with only 3 grams of fat but 15 grams of protein! 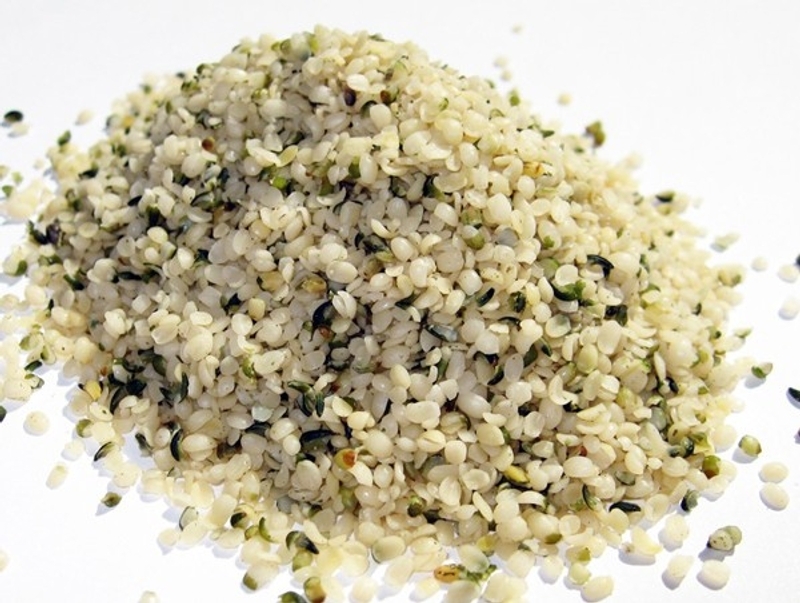 Hemp protein is also cholesterol-free and saturated fat-free. Since hemp protein contains all essential amino acids and is a lean source of protein, it’s a very effective natural metabolism booster. Protein requires more energy to digest than fats or carbohydrates, which means your body burns more calories just by consuming it. Since hemp protein is from a raw source of protein, it’s even better for your body and metabolism. Hemp is also full of iron, magnesium and zinc. Per three tablespoons, hemp protein has 40% of your daily iron requirements, 60 percent of your daily magnesium requirements, and 25 percent of your daily zinc requirements. These nutrients are critical for optimizing energy on a plant-based diet. It’s much better to get your nutrients from raw foods that your body can absorb than from highly processed protein powders or supplements. Most plant-based proteins contain a little bit of fiber, but most none of them besides chia seeds compare to the fiber found in hemp protein. Per three tablespoons, hemp protein provides 8-15 grams of fiber depending on the type of hemp protein you choose. That’s more than a bowl of oatmeal or two- three whole bananas! Fiber is important for regulating your blood sugar, protecting your heart, aiding in digestion, and maintaining a healthy weight. For such a healthy protein source, hemp is very inexpensive. Because it’s only mildly processed and such a sustainable food, it can be purchased at a fair price, even in organic form. You can usually buy a pound of raw, organic hemp protein for around $15.00, which is around the same cost as those highly refined, cheap tubs of hormone-filled whey protein powders sold at chain superstores. Most organic hemp proteins are also non-GMO, cold-milled, and processed without any chemicals whatsoever. This low-cost feature is great if you’re on a budget but looking to eat healthy without sacrificing quality. Hemp protein is also very tasty, especially in a smoothie! It has a deliciously rich, nutty taste when blended with other ingredients. Some great pairings to use with hemp are: blueberries, acai, raspberries, blackberries, cinnamon, vanilla, coconut milk, almond milk, spinach, chia, banana, and almond butter. You can also use it to bake with in replacement to flour or use it in a homemade dessert or protein bar recipe. Watching your carbs? You’ll be happy to know that hemp protein is very low in net carbs. Net carbs are the amount of carbs left after you subtract fiber from the total carb count. Since fiber does not impact blood sugar levels or cause weight gain, it’s not considered a net carb like sugar and starch are. A low-carb, plant-based diet may be beneficial for your blood sugar and weight, though healthy complex carbs most certainly have their place in one’s diet too. Hemp also contains EFA’s, which are essential fatty acids. EFA’s are important for lean body mass, brain function, and protecting the heart. Hemp seeds contains roughly 1245 grams of omega 3 fatty acids in just 1.5 tablespoons! Hemp protein’s greenish brown color denotes the natural chlorophyll found in hemp seeds. Chlorophyll is the green pigment found in plants that provides your body with alkaline protection against inflammation. Hemp protein is also rich in potassium, which can help balance your electrolytes and aid in water balance. This can also help prevent joint pain and muscle cramps, which all fitness buffs know is no fun to deal with. Hemp contains roughly 370 milligrams of potassium in just three tablespoons, which is more than twice as much as orange and more than twice as much as a cup of spinach! Hemp protein is also one of the easiest proteins to digest. It’s grain-free, nut-free, gluten-free, vegan, and very easy for the body to process. This makes it a perfect option for anyone on a 100 percent plant-based diet or someone just looking to add a cleaner protein to their fitness routine. You can also choose between regular hemp protein, higher fiber hemp protein, or fiber-free hemp protein depending on your health goals. What are you waiting for? Trade in the whey today and give hemp protein a try! Do you use hemp protein powder? Thanks for sharing such an amazing article. Hemp protein has so many benefits and the best part is it is really helpful in keeping our heart healthy. Sorry, but it is not delicious. It is tolerable, and better when mixed with other proteins and flavors as in Orgain Vanilla protein powder. I haven\’t found much that will cover the taste otherwise.